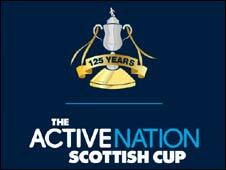 Edinburgh City are in the hat for the fourth round of the Scottish Cup after a convincing win over Keith. The hosts took the lead when Derek Nicol scored an own goal, slicing Douglas Gair's cross into the net. They doubled their lead in 24 minutes when Jordan Caddow squared for Gair to fire past goalkeeper Andrew Shearer. The pair combined again for Gair to score his second and Edinburgh's third. Keith netted a consolation in injury-time through Gary Harris. Edinburgh City: Montieth, Morrison, Ross (Wilson 89), Bruce, Harrison, McFarland, Caddow, Gair, Clee, MacNamara (Callandine 87), Denholn. Subs Not Used: Stenhouse, Black, MacKensie. Goals: Nicol 19 og, Gair 24, 70. Keith: Shearer, Watt (Harris 85), Lonie, Still, Niddrie, Nicol, Walker, MacKay (Collins 62), Park (Cammy Keith 70), Lennox, Donaldson. Subs Not Used: Duff, Craig.